SimGuruZera and SimGuruRachel posted 2 new blogs on the official site today. Both blogs are about the new updates, one of them specifically about ghosts which will be added in today's update! Exclusive: Ghosts! POOLS, Star Wars and New Career tracks! I just had the honour to attend a live conference call with a lot of other fansites and YouTubers and during that call we learned a lot about upcoming updates for The Sims 4! 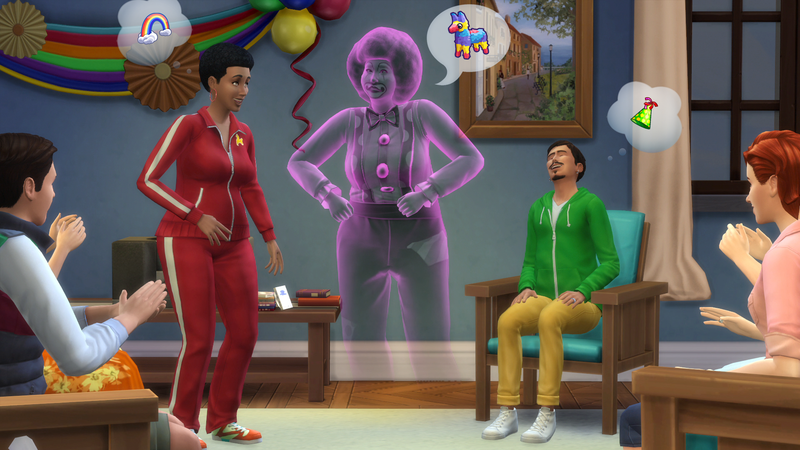 Today we will get an update in our games where the Sims team is adding ghosts! Yes, you read it, ghosts! When after installing the update your Sims die, they can come out of their tombstones. If they had a good relationship with other Sims in the household prior to their death, they can eventualy move back into the household and become a playable character again! If they aren't friendly, you can befriend them and have them move in. Ghosts change into the colour of their mood. So a playful or flirty Sim would be pink, et cetera. Ghosts can woohoo with other ghosts and with living Sims, but they cannot reproduce (so they can't have any kids after they've died). Each type of death comes with special behaviour. Meaning that if a Sim has died in a fire while being angry, they can start a fire as a ghost when they're angry. Ghosts who died by emotion will have an area of effect around them that will influence other Sims's moods around them. Once a ghost has rejoined the household, they can die again, but only in a fire. Ghosts will retain their skills and traits. They won't have their career anymore but they can start over. Ghosts can hunt objects. Ghosts can also break plumbing. Sims who died from electrocution can also break electrical items. Ghosts will be "stuck" in the age they had when they died. Ghosts can do most of the things a normal Sim can do, with a few exceptions. They can still get married. They can complete all aspirations. It mostly comes with a bunch of cool new features normal Sims don't have. Ahhh I can't wait anymore! A couple of other features in today's update are new eye colours (a variety of colours including purple, olive green hazel, some blues, hazel colours etc). And the team has also fixed a number of bugs. More details about the entire list of features will be posted later. 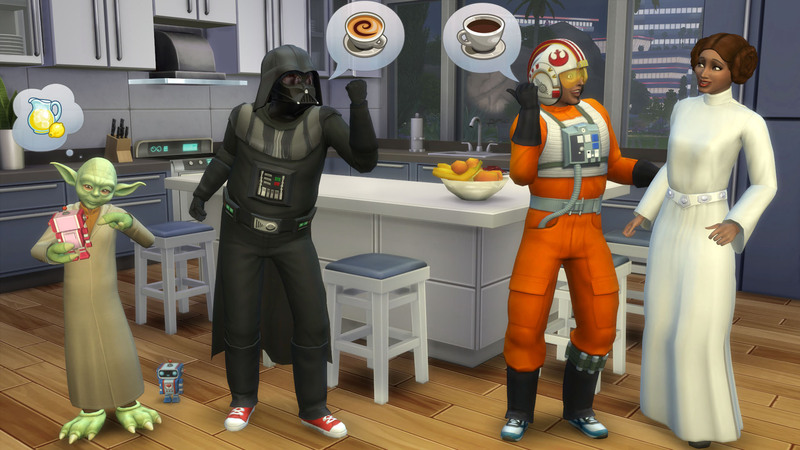 We are happy to announce that the Force is strong with our Sims. Because we are getting awesome Star Wars costumes for kids, teens, young adults, adults and elders. There is Darth Vader and Luke Skywalker for male teens/(young)adults/elders and a Leia for female teena/(young) adults/elders, and Yoda for kids of both genders! The next update will be in November and will feature POOLS! YES! POOLS! AHHHHHHH! When the time comes we will post more information about this update. For now, we can only say that this will add a new way to die, which is drowning. Yay! In December we will get a bunch of new career tracks for our games. No details on this yet, but it will add more gameplay and that's awesome. I should mention that ALL the game updates in this post will be free for everyone and they come in the form of a patch. So you only need to update your game (which happens automatically through Origin). I would like to thank EA for including me in this conference call. I was SO nervous but I'm so happy to hear and share the good news with you guys! Check your games today to get the first free update. Exciting week in The Sims 4! According to The Sims studio on Twitter, it will be an exciting week in The Sims 4! Stay tuned to find out more very soon. SimGuruRiley has recently shared a new blog talking about what a day at The Sims Studio looks like for an animator. With The Sims 4 now launched, I thought it would be fun to show you what my typical day is like as a Senior Animator at the Studio! First order of the day is to check email for any issues, concerns or requests, while I am syncing down the latest build of the game. I look over my calendar to see if I have any meetings to review design or implementation plans. If I don’t have any meetings that usually means I will be animating, testing or refining our work in the game. The animation team usually has a quick meeting in the morning. It’s like a roll call. When our name is called out we declare the work that we will be doing that day. A one sentence statement about the overall feature and how much we have completed usually does the trick. As a team it is advantageous for us to understand who is working on what assets. 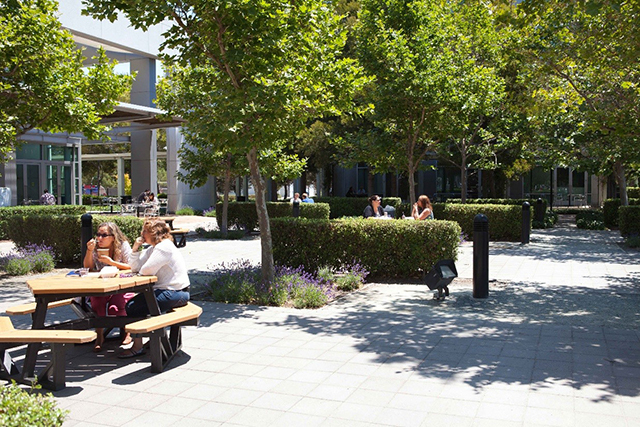 Informal and quick, the meeting rarely lasts longer than 5 to 10 minutes. We return to our stations and continue work. For the next hour our Animation Directors will meet with each of us to review our animation for quality. The team is large and the Directors have split us in half to help focus the review time. We are, affectionately, Red Team and Blue Team. During the review with a Director we will look at the first pass of blocked out animation, shoot reference video, talk about how a feature is going to work in game, receive feedback on animation or discuss technical issues we have. I like to go out with my Animation Pod. I mentor three animators and we try to get off campus and go out to lunch together once a week. Each time it’s a new place – the hardest part is trying to get all four of us to decide where to go. Today EA/Maxis released a new patch for The Sims 4. Here's a list of the issues Maxis has fixed. The SimGurus have recenlty shared a fun blog post talking about the "Top 10 Things" you will see in The Sims 4. Be in the know when it releases! With rich Emotions and quirky personality traits our all new Sims are more expressive than ever. This has a dramatic impact on the choices available to them throughout the game! We’ve said it before but it bears repeating; it’s what’s on the inside that really matters now. 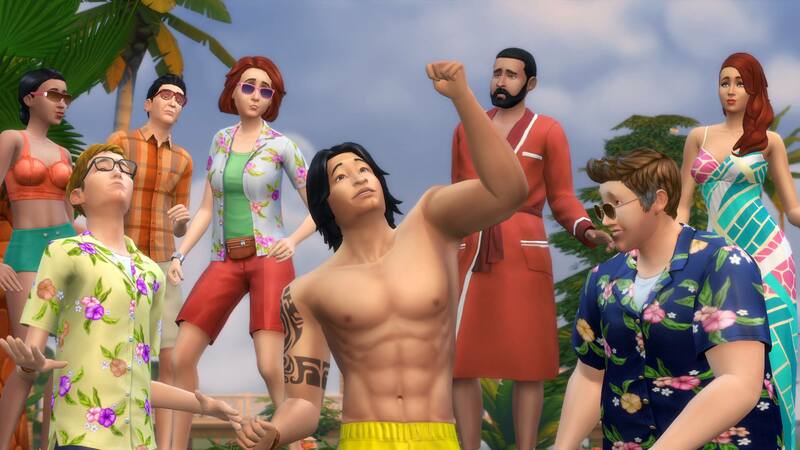 Storytelling with The Sims 4 is more powerful, more fun, and more entertaining. The Sims 4 has officially released in North America today. So did the first patch for The Sims 4. Here's a list of the issues Maxis has fixed. ·Fixed a crash in Build Mode by preventing the game from thinking fences were rooms. ·Fixed a crash in Create A Sim that could occur after the you lock and unlock your computer. ·Fixed an issue with “Shine on Men’s Suit”, “Glitter and Abs”, “Big Hat of Shame”, “Star-Spangled Glasses” and the “Tiki Bar”, not remembering their unlocked state upon reload. ·Fixed several issues with Sims attempting to go on dates with the Reaper, resulting in non-responsive game states.The Reaper still loves ya baby, he is just too busy to go on a date with every lovelorn Sim that vies for his attention. ·You can now exit Build Mode when not on your home lot if a baby was incorrectly left in the home lot inventory. ·Game no longer hangs if you attempt to split a household with a baby on the lot and in the household inventory. ·Splitting and merging households no longer results in unplayable households due to babies being left in household inventories. ·Babies are no longer left locked in the household inventory if all the other Sims in the household die. ·Babies no longer multiply if left in the Household Inventory while editing the lot via Manage Worlds. · Fixed an issue where Gallery households that have been merged with another household were preventing Live Mode from loading. ·Adding a new Sim to a played household via Create A Sim by going from Manage Worlds will now allow you to modify their face and body. ·Lots with scaled objects (via the shift + [,] cheat) that are shared to the Gallery will now remember their enlarged state for others to enjoy. ·Fixed an issue where the game would become non-responsive when attempting to save a lot to the your library. SimGuruZephyr has recently shared a new blog post talking about the familiar faces of Willows Creek. The Sims' official facebook page has shared a new screenshot from the upcomming trailer. "Are you ready for the New The Sims 4 Trailer tomorrow?